The grotesques invade the movie screens this Hallowe'en. And while science fiction fanboy nirvana is poised to rule the month, and will, scrappy horror challengers aim to nibble away at its feet - Madeas, John Saws, killers in pig masks, and malevolent snowmen all wait in the shadows to take the runner down. In what is the month's queen bee and assumed sole $100 million earner, Ryan Gosling must navigate a futuristic world and its colorful supporting characters (Jared Leto, Dave Bautista, and Robin Wright are on standby), before reaching Harrison Ford's Rick Deckard and discovering the answer to whatever question he had presumably posed at film's beginning (you only get one, so make it count, Gosling!). The first film, which I saw one time ten years ago, was a respectable science fiction entertainment with the expected thematic points about whether a robot can ever hope to be human instead of a card-carrying member of the Machine Empire. As I understand it, fans of the original appreciate the 1982 film's special effects and set design, most of which are a trademark of Blade Runner's helmer, Ridley Scott, who began in commercials and carried over their sense of style. Blade Runner, set in 2019, was also noted for its genre-defining vision of a vaguely dystopian future of Babel-tall buildings and mega-screen advertising (personally, futuristic/alternate world films that I think are a bit more topical are V for Vendetta, Watchmen, and the little-seen 1981 Shock Treatment, a musical that managed to foresee so many things). Now, after many years, a sequel emerges and that's all good, but though its fans might not mind, Blade Runner 2049 has been completed at an inhumane length of two hours and forty three minutes, projected on a giant numbing IMAX screen pitched at highest sharpest decibel. And in a year that has already given us such gems as 2 hours and 15 minutes (Logan), 2 hours and 20 minutes (War for the Planet of the Apes), 2 hours and 29 minutes (Transformers 5), and 2 hours and 21 minutes (Kingsman: The Golden Circle... honestly, what the actual... ?!? ), I fear that Blade Runner's running time, which has been spared the wrath of a particularly eager editor, is simply too demanding on my cinematic spirit; and with a taxing Rotten Tomatoes rating of 90%, which means I'll actually have to use my brain, the film is asking a lot. Directing duties on Blade Runner 2 have been commandeered by Denis Villeneuve, who made Prisoners, which I consider the best film of 2013, and who then went on to direct both Sicario (2015) and Arrival (2016), two films that... a lot of other people quite liked. 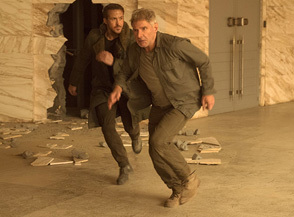 Judging by its aforementioned reviews, a lot of people quite like Blade Runner 2049, too - so much so that it should overcome its length and vague unfamiliarity to modern audiences to smash through the $100 million dollar mark, in the process denying Madea or some other scrappy horror film bragging rights for month's biggest.